Help the hog jump high into the sky! Click to launch your hog. Jump as high as possible. So try to launch your hog with the strongest power. Click on balloons to grapple and upgrade. Use A and D to move your hog. Hit the bonus balloons for more points. There are no balloons under the boundary. So do not fall too far. Grapple Hog is a skill game provided by www.bestgames.pk. Have fun! 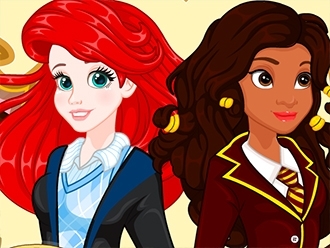 Disney Priness Ariel and Moana are admitted to the Hogwarts School of Wizardry and Witchcraft. They are so excited! On their first day of school, they will be sorted to different schools by the sorting hat. then help them dress up with their school uniforms and get to the dinner hall asap. there will be a maze in school that you should help them pass through. Have an adventurous time with Ariel and Moana!